Descriptors: stress, Alzheimer's disease, allostatic load, cognitive decline, memory. Descritores: estresse, doença de Alzheimer, carga alostática, declínio cognitivo, memória. A carga alostática é definida como a ativação frequente dos sistemas neuroendócrino, imunológico, metabólico e cardiovascular, o que torna os indivíduos mais suscetíveis a problemas de saúde relacionados ao estresse. Segundo este modelo, as desregulações fisiológicas começam a surgir décadas antes das doenças se manifestarem. Consequentemente, a pesquisa de estresse tem desviado sua atenção para antecipar o grau de desregulação para entender melhor o impacto dos hormônios do estresse e outros biomarcadores na progressão da doença. Tendo em vista o crescente número de estudos que demonstram a influência de fatores de risco modificáveis no declínio cognitivo, além dos efeitos dos mediadores crônicos do estresse, o objetivo da presente revisão foi apresentar uma visão geral do desenvolvimento de alterações cognitivas a partir de estudos sobre o estresse e seus mediadores. Although various factors are associated with cognitive decline during aging, it is unclear which factors trigger the neurodegenerative process in cases of dementia. Chronic exposure to stress throughout the lifespan has been the focus of many studies because of the similarities between the biological mechanisms involved in chronic stress and the pathophysiology of Alzheimer's disease (AD), one of the leading causes of dementia worldwide. There is consistent evidence showing that cortisol, the main stress mediator, is associated with both cognitive decline and AD. However, it remains unclear whether the altered cortisol is the cause or consequence of neurodegeneration. Beta-amyloid (Aβ) protein deposition, neuroinflammation, hyperphosphorylation of tau protein, changes in glucose metabolism and insulin signaling are some of the effects of primary mediators of stress that cumulatively can cause decreases in the synaptic network and neuroplasticity, hippocampal and cortical atrophy, and consequently, cognitive decline. This "wear and tear" of chronic stress known as allostatic load is related to the prolonged and sustained exposure to the primary stress mediators that progressively damage brain structures associated with cognitive functions, increasing the risk of disease. This review will explain the similarities between the mechanisms that trigger AD and the effects of stress mediators in the brain to support the hypothesis that, through the allostatic load process, chronic stress during lifespan may seed the vulnerability for developing cognitive impairment later in life. Various studies with animals and humans have shown that neuroinflammation, mediated by microglial activation, plays an important role in the amyloidogenic process (for a review, see Hommet et al., 2014).11 Although microglial activation is beneficial in AD because it facilitates the elimination of Aβ peptide,12-15 it may also damage brain tissue due to the release of proinflammatory mediators, such as IL-1β, IL-6, and TNFα.11 Neuroinflammation, in turn, leads to oxidative stress, cell damage and death in structures essential for cognitive abilities and, consequently, to cognitive decline.11 However, the exact factor that contributes to the activation of this neuroinflammation process is still unclear. Although genetic elements such as APOE alleleε4 are significant AD risk factors, other factors represent risk conditions for the disease. Similarities between the effects of chronic stress and the neuropathological mechanisms involved in the development of AD have reinforced the hypothesis that chronic stress is an important risk factor for cognitive decline during the aging process and for the conversion of mild cognitive impairment (MCI) to AD. The present article reports evidence that supports the hypothesis that chronic stress may be one of these "other factors" involved in the AD neurodegenerative process. Whether these cognitive effects are temporary or permanent depends on the period of exposure to the stressor event. The harmful effects of stress are intensified during windows of vulnerability, when there is sustained action of its mediators during periods of insufficient functional biological reserves, i.e., during periods of brain development (in childhood) or during its degeneration (aging).56 The harmful effects of chronic stress on memory may not be permanent in adulthood, i.e., once the stressor has ceased, cortisol concentrations return to baseline levels and memory performance improves. However, the cumulative damage from exposure to stress response mediators over the lifespan produces structural changes in the brain that increase the risk of developing cognitive disorders during aging, such as AD. Prolonged stress conditions and the absence of adaptive coping strategies cause the accumulation of structural and functional changes in the hippocampus and prefrontal cortex, induced by the sustained action of primary mediators of stress response in the central nervous system. This constitutes a risk condition for developing cognitive impairment and dementia. The hypothesis that chronic stress may be a risk factor for AD is primarily based on the similarities between the effects of its primary mediators and the mechanisms that trigger AD (Table 1). 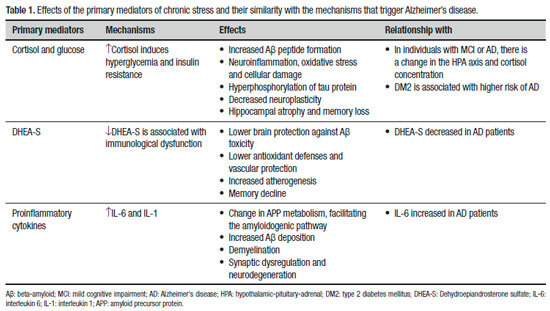 As previously explained, chronic exposure to stress mediators induces neuroinflammation, hyperglycemic states associated with changes in glucose metabolism and insulin signaling, Aβ accumulation, and hyperphosphorylation of tau protein (Table 1). Mediated by oxidative stress, these combined changes affect neuronal functioning, altering synaptic transmission and neuroplasticity, and lead to hippocampal atrophy, causing impaired cognitive performance, especially in learning and memory (Table 1). Figure 1. Factors associated with Amyloid-beta peptide accumulation. Chronic stress may constitute another factor that contributes to the accumulation of toxic amyloid beta in late-onset Alzheimer's disease. Betaamyloid peptide accumulation promotes the formation of pathological tau tangles that lead to synaptic dysfunction and memory-supporting neuron death, impairing cognitive performance. A large body of evidence has shown that the cumulative effects of chronic stress on AD pathology is based on the concentration of glucocorticoids (corticosterone or cortisol). 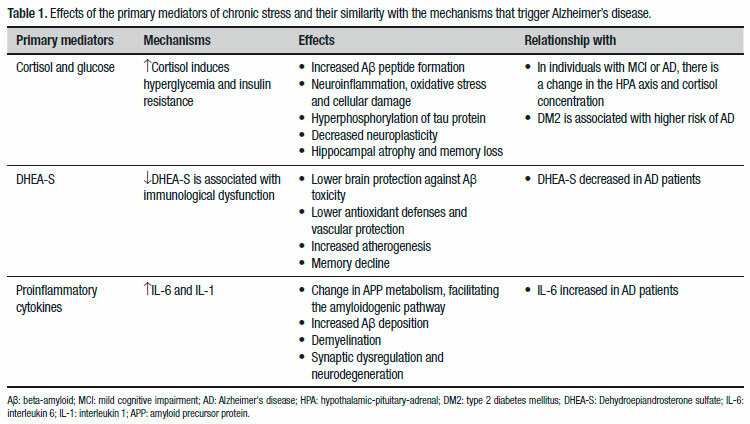 However, other primary mediators of chronic stress, such as glucose, DHEA-S and proinflammatory cytokines, are also associated with AD (Table 1). Changes in brain glucose metabolism contribute to cell degeneration and appear to be associated with the onset and progression of AD.42 High glucose concentrations, mediated by hypercortisolism, insulin resistance and altered glucose metabolism in the brain, are associated with Aβ accumulation and increased phosphorylation of tau protein.80-85 Various epidemiological studies have demonstrated an independent association between AD and type 2 diabetes mellitus (DM2). A meta-analysis found that DM2 increases the risk of developing AD by 39% regardless of the presence of cardiovascular comorbidities.86 Although there is no conclusive explanation for this association, one hypothesis suggests that it is mediated by moderate hypercortisolism usually present in the early stages of AD.87 The circadian rhythm of cortisol secretion is one of the main determinants of glycemia in humans, and high concentrations of cortisol over a long period of time may be diabetogenic due to adrenal hyperresponsiveness to ACTH.87 Hypercortisolism increases the risk of a pre-diabetic condition and DM2 in older adults with mild AD, decades before dementia manifests. 87 See Table 1. Regarding proinflammatory cytokines, some authors claim that AD is fundamentally an immunologically driven process, since IL-6 and IL-1 are associated with altered APP metabolism.95 One study used the immunohistochemistry technique on brain tissue and showed that in the early stages of AD, amyloid plaques are colocalized with acute-phase proteins and proinflammatory cytokines.96 Interleukin IL-1 and IL-6 have been associated with neuronal damage because of increased Aβ deposition,97 demyelination and neurodegeneration.98 IL-6 levels were high in the AD population compared to healthy older adults and inversely correlated with Mini-Mental State Examination scores.99 Reducing the concentration of proinflammatory cytokines could have beneficial effects on AD symptomatology.100 A meta-analysis demonstrated that, regardless of age, older adults with AD display higher concentrations of IL-699 (Table 1). The similarities between chronic stress and AD are not limited to the effects of their primary mediators. Secondary effects of chronic stress, represented by allostatic load biomarkers, are also associated with dementia, reinforcing the hypothesis that prolonged stress constitutes a risk factor for AD. Different elements produce a nonlinear and multisystemic association between the effects of the primary and secondary mediators of chronic stress and the mechanisms that trigger AD. Although acute stress is a natural and necessary response to maintain the human organism, chronic exposure to its biological mediators can cumulatively impair brain structures essential to cognitive functioning, thus representing a risk factor for cerebral aging and vulnerability to cognitive decline. The early identification in adulthood of individuals who report constant psychological stress and have altered allostatic load mediators constitutes a promising target of interventions to reduce the prevalence of dementia and contribute to successful cerebral aging. In this context, diet and nutritional status interventions can play an important preventive role. Acknowledgements. The current study was supported by the Coordenação de Aperfeiçoamento de Pessoal de Nível Superior (CAPES). 1. Alzheimer's Association. 2013 Alzheimer's disease facts and figures. Alzheimer's & dementia. 2013;9(2):208-45. 2. Dubois B, Feldman HH, Jacova C, Cummings JL, DeKosky ST, Barberger-Gateau P, et al. Revising the definition of Alzheimer's disease:a new lexicon. Lancet Neurol. 2010;9(11):1118-27. 3. Prince M, Bryce R, Albanese E, Wimo A, Ribeiro W, Ferri CP. The global prevalence of dementia:a systematic review and metaanalysis. Alzheimers Dement. 2013;9(1):63-75. 4. Bloom GS. 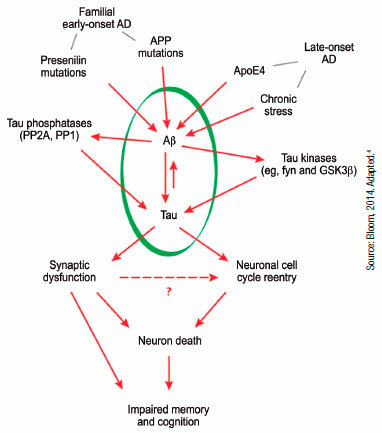 Amyloid-β and tau:the trigger and bullet in Alzheimer disease pathogenesis. JAMA Neurol. 2014;71(4):505-8. 5. Gómez-Isla T, Price JL, McKeel Jr DW, Morris JC, Growdon JH, Hyman BT. Profound loss of layer II entorhinal cortex neurons occurs in very mild Alzheimer's disease. J Neurosci. 1996;16(14):4491-500. 6. Schuff N, Woerner N, Boreta L, Kornfield T, Shaw LM, Trojanowski JQ, et al. The Alzheimer's Disease Neuroimaging Initiative. MRI of hippocampal volume loss in early Alzheimer's disease in relation to ApoE genotype and biomarkers. Brain. 2009;132(4):1067-77. 7. Selkoe DJ. The molecular pathology of Alzheimer's disease. Neuron. 1991;6(4):487-498. 8. Busciglio J, Lorenzo A, Yeh J, Yankner BA.β-Amyloid fibrils induce tau phosphorylation and loss of microtubule binding. Neuron. 1995;14(4): 879-88. 9. Block ML, Zecca L, Hong JS. Microglia-mediated neurotoxicity: uncovering the molecular mechanisms. Nat Rev Neurosci. 2007;8(1):57-69. 10. Li Y, Liu L, Barger SW, Griffin WST. Interleukin-1 mediates pathological effects of microglia on tau phosphorylation and on synaptophysin synthesis in cortical neurons through a p38-MAPK pathway. J Neurosci. 2003;23(5):1605-11. 11. Hommet C, Mondon K, Camus V, Ribeiro MJ, Beaufils E, Arlicot N, et al. Neuroinflammation andβ amyloid deposition in Alzheimer's disease:in vivo quantification with molecular imaging. Dement Geriatr Cogn Disord. 2014;37(1-2):1-18. 12. Meda L, Baron P, Scarlato G. Glial activation in Alzheimer's disease: the role of Abeta and its associated proteins. Neurobiol Aging. 2001;22(6): 885-93. 13. Morgan D, Gordon MN, Tan J, Wilcock D, Rojiani AM. Dynamic complexity of the microglial activation response in transgenic models of amyloid deposition: implications for Alzheimer therapeutics. J Neuropathol Exp Neurol. 2005;64(9):743-53. 14. Tuppo EE, Arias HR. The role of inflammation in Alzheimer's disease. Int J Biochem Cell Biol. 2005;37(2):289-305. 15. Hickman SE, Allison EK, El Khoury J. Microglial dysfunction and defective beta-amyloid clearance pathways in aging Alzheimer's disease mice. J Neurosci. 2008;28(33):8354-60. 16. Shonkoff JP, Boyce WT, McEwen BS. Neuroscience, molecular biology, and the childhood roots of health disparities:building a new framework for health promotion and disease prevention. JAMA. 2009;301(21):2252-9. 17. Sapolsky RM, Romero LM, Munck AU. How do glucocorticoids influence stress responses? Integrating permissive, suppressive, stimulatory, and preparative actions. Endocr Rev. 2000;21(1):55-89. 18. Lupien SJ, Maheu F, Tu M, Fiocco A, Schramek TE. The effects of stress and stress hormones on human cognition:Implications for the Field of brain and cognition. Brain and Cognition. 2007;65(3):209-37. 19. Joels M, de Kloet ER. Effects of glucocorticoids and norepinephrine on the excitability in the hippocampus. Science. 1989;245(4925):1502-5. 20. de Kloet ER, Oitzl MS, Joels M. Stress and cognition:are corticosteroids good or bad guys? Trends in Neurosci. 1999;22(10):422-6. 21. Sterling P, Eyer J. Allostasis: Stress, cognition and health. Philadelphia (Pennsyvania): John Wiley & Sons. 1988; Allostasis a new paradigma to explain arousal pathology. p.629-40. 22. Picard M, Juster RP, McEwen BS. Mitochondrial allostatic load puts the "gluc" back in glucocorticoids. Nat Rev Endocr. 2014;10(5):1-8. 23. Du J, Wang Y, Hunter R, Wei Y, Blumenthal R, Falke C, et al. Dynamic regulation of mitochondrial function by glucocorticoids. Proc Natl Acad Sci USA. 2009;106(9):3543-8. 24. Juster RP. McEwen BS, Lupien SJ. Allostatic load biomarkers of chronic stress and impact on health and cognition. Neurosci Biobehav Rev. 2010;35(1):2-16. 25. McEwen BS. Interacting mediators of allostasis and allostatic load: towards an understanding of resilience in aging. Metabolism. 2003;52: 10-6. 26. Sapolsky RM. The physiological relevance of glucocorticoid endangerment of the hippocampus. Ann N Y Acad Sci. 1994;746(1):294-304. 27. Lin MT, Beal MF. Mitochondrial dysfunction and oxidative stress in neurodegenerative diseases. Nature. 2006;443(7113):787-95. 28. McEwen BS. Proctetive and damaging effects of stress mediators. N Engl J Med. 1998;338(3):171-9. 29. McEwen BS. Stress, adaptation, and disease:Allostasis and allostatic load. Ann N Y Acad Sci. 1998;840(1):33-44. 30. Madrigal JL, Olivenza R, Moro MA, Lizasoain I, Lorenzo P, Rodrigo J, et al. Glutathione depletion, lipid peroxidation and mitochondrial dysfunction are induced by chronic stress in rat brain. Neuropsychopharmacology. 2001;24(4):420-9. 31. Gong Y, Chai Y, Ding JH, Sun XL, Hu G. Chronic mild stress damages mitochondrial ultrastructure and function in mouse brain. Neurosci Lett. 2011;488(1):76-80. 32. Rezin GT, Cardoso MR, Gonçalves CL, Scaini G, Fraga DB, Riegel RE, et al. Inhibition of mitochondrial respiratory chain in brain of rats subjected to an experimental model of depression. Neurochem Int. 2008;53(6-8):395-400. 33. Tang VM, Young AH, Tan H, Beasley C, Wang JF. Glucocorticoids increase protein carbonylation and mitochondrial dysfunction. Horm Metab Res. 2013;45(10):709-15. 34. McKim DB, Niraula A, Tarr AJ, Wohleb ES, Sheridan JF, Godbout, JP. Neuroinflammatory dynamics underlie memory impairments after repeated social defeat. J Neurosci. 2016;36(9):2590-604. 35. Sandi C. Stress, cognitive impairment and cell adhesion molecules. Nature Rev Neurosci. 2004;5(12):917. 36. Landfield P, Baskin RK, Pitler TA. Brain-aging correlates:retardation by hormonal-pharmacological treatments. Science. 1981;214(4520):581-3. 37. Shalev I, Entringer S, Wadhwa PD, Wolkowitz OM, Puterman E, Lin J, et al. Stress and telomere biology:a lifespan perspective. Psychoneuroendocrinology. 2013;38(9):1835-42. 38. Testa R, Olivieri F, Sirolla C, Spazzafumo L, Rippo MR, Marra M, et al. Leukocyte telomere length is associated with complications of type 2 diabetes mellitus. Diabetic Med. 2011;28(11):1388-94. 39. Stein LJ, Dorsa DM, Baskin DG, Figlewicz DP, Porte JR, Woods SC. Reduced effect of experimental peripheral hyperinsulinemia to elevate cerebrospinal fluid insulin concentrations of obese Zucker rats. Endocrinology. 1987;121(5):1611-5. 40. Medikayala S, Piteo B, Zhao X, Edwards JG. Chronically elevated glucose compromises myocardial mitochondrial DNA integrity by alteration of mitochondrial topoisomerase function. Am J Physiol Cell. 2011; 300(2):C338-48. 41. Suzuki S, Hinokio Y, Komatu K, Ohtomo M, Onoda M, Hirai S, et al. Oxidative damage to mitochondrial DNA and its relationship to diabetic complications. Diabetes Res Clin Pract. 1999;45(2-3):161-8. 42. Lee YJ, Jeong SY, Karbowski M, Smith CL, Youle RJ. Roles of the mammalian mitochondrial fission and fusion mediators Fis1, Drp1, and Opa1 in apoptosis. Mol Biol Cell. 2004;15(11):5001-11. 43. Marks JL, King MG, Baskin DG. Localization of insulin and type 1 IGF receptors in rat brain by in vitro autoradiography and in situ hybridization. Adv Exp Med Biol. 1991;293:459-70. 44. Rehman K, Akash MS. Mechanisms of inflammatory responses and development of insulin resistance:how are they interlinked? J Biomed Sci. 2016;23(1):87. 46. Cardona-Gómez GP, Mendez P, DonCarlos LL, Azcoitia I, Garcia-Segura LM. Interactions of estrogens and insulin-like growth factor-I in the brain:implications for neuroprotection. Brain Res Rev. 2001; 37(1-3):320-34. 47. Dudek H, Datta SR, Franke TF, Birnbaum MJ, Yao R, Cooper GM, et al. Regulation of neuronal survival by the serine-threonine protein kinase Akt. Science. 1997;275(5300):661-5. 48. Martin ED, Sanchez-Perez A, Trejo JL, Martin-Aldana JA, Cano Jaimez M, Pons S, et al. IRS-2 Deficiency impairs NMDA receptor-dependent long-term potentiation. Cereb Cortex. 2012;22(8):1717-27. 49. Sapolsky R, Krey L, McEwen BS. The adrenocortical stress response in the aged male rat:impairment of recovery from stress. Exp Gerontol. 1983;18(1):55-64. 50. Lupien SJ, de Leon M, De Santi S, Convit A, Tarshish C, Nair NPV, et al. Cortisol levels during human aging predict hippocampal atrophy and memory deficits. Nature Neurosci. 1998;1(1):69. 51. Artola A, Von Frijtag JC, Fermont PC, Gispen WH, Schrama LH, Kamal A, et al. Long‐lasting modulation of the induction of LTD and LTP in rat hippocampal CA1 by behavioural stress and environmental enrichment. Eur J Neurosci. 2006;23(1):261-72. 52. Kim JJ, Diamond DM. The stressed hippocampus, synaptic plasticity and lost memories. Nature Rev Neurosci. 2002;3(6):453. 53. Kim JJ, Song EY, Kim JJ, Song EY, Kosten TA. Stress effects in the hippocampus:synaptic plasticity and memory. Stress. 2006;9(1):1-11. 54. Park HJ, Lee S, Jung JW, Kim BC, Ryu JH, Kim DH. Glucocorticoid-and long-term stress-induced aberrant synaptic plasticity are mediated by activation of the glucocorticoid receptor. Arch Pharm Res. 2015;38(6):1204-12. 55. Wosiski-Kuhn M, Erion JR, Gomez-Sanchez EP, Gomez-Sanchez CE, Stranahan AM. Glucocorticoid receptor activation impairs hippocampal plasticity by suppressing BDNF expression in obese mice. Psychoneuroendocrinology. 2014;42:165-77. 56. Lupien, SJ, McEwen BS, Gunnar MR, Heim C. Effects of stress throughout the lifespan on the brain, behavior and cognition. Nature Rev Neurosci. 2009;10(6):434-45. 57. Green KN, Billings LM, Roozendaal B, McGaugh J, LaFerla FM. Glucocorticoids increase amyloid-β and tau pathology in a mouse model of Alzheimer´s disease. Neurobiol Dis. 2006;26(35):9047-56. 58. Kulstad JJ, McMillan PJ, Leverenz JB, Cook DG, Green PS, Peskind ER, et al. Effects of chronic glucocorticoidadministration on insulin-degrading enzyme and amyloid-β peptide in the aged macaque. J. Neuropathol. Exp Neurol. 2005;64(2):139-46. 59. Sotiropoulos I, Catania C, Pinto LG, Silva R, Pollerberg GE, Takashima A, et al. Stress acts cumulatively to precipitate Alzheimer's disease-like tau pathology and cognitive deficits. J Neurosci. 2011;31(21):7840-7. 60. Catania C, Sotiropoulos I, Silva R, Onofri C, Breen KC, Sousa N, et al. The amyloidogenic potential and behavioral correlates of stress. Mol psych. 2009;14(1):95. 61. Dong H, Yuede CM, Yoo HS, Martin MV, Deal C, Mace AG, et al. Corticosterone and related receptor expression are associated with increasedβ-amyloid plaques in isolated Tg2576 mice. Neuroscience. 2008;155(1):154-63. 62. Baglietto-Vargas D, Medeiros R, Martinez-Coria H, LaFerla FM, Green KN. Mifepristone alters amyloid precursor protein processing to preclude amyloid beta and also reduces tau pathology. Biol psych. 2013; 74(5):357-66. 63. Peavy GM, Santiago DP, Edland SD. Subjective memory complaints are associated with diurnal measures of salivary cortisol in cognitively intact older adults. Am J Geriatr Psychiatry. 2013;21(9):925-8. 64. Lupien S, Lecours AR, Lussier I, Schwartz G, Nair NP, Meaney MJ. Basal cortisol levels and cognitive deficits in human aging. J Neurosci. 1994;14(5, Pt. 1):2893-903. 65. Andel R, Crowe M, Kåreholt I, Wastesson J, Parker MG. Indicators of job strain at midlife and cognitive functioning in advanced old age. J Gerontol B Psychol Sci Soc Sci. 2011;66(3):287-91. 66. Andel R, Infurna FJ, Hahn Rickenbach EA, Crowe M, Marchiondo L, Fisher GG. Job strain and trajectories of change in episodic memory before and after retirement. J Epidemiol Community Health. 2015;69(5): 442-6. 67. Fiocco AJ, Wan N, Weekes N, Pim H, Lupien SJ. Diurnal cycle of salivary cortisol in older adult men and women with subjective complaints of memory deficits and or depressive symptoms:Relation to cognitive functioning. Stress. 2006;9(3):143-52. 68. Sindi S, Hagman G, Håkansson K, Kulmala J, Nilsen C, Kåreholt I, Soininen H, Solomon A, Kivipelto M. Midlife Work-Related Stress Increases Dementia Risk in Later Life:The CAIDE 30-Year Study. J Gerontol B Psychol Sci Soc Sci. 2016;72(6):1044-53. 69. Davis KL, Davis BM, Greenwald BS, Mohs RC, Mathe AA, Johns CA, et al. Cortisol and Alzheimer's disease, I:Basal studies. Am J Psychiatry. 1986;143:300-05. 70. Maeda K, Tanimoto K, Terada T, Shintani T, Kakigi T. Elevated urinary free cortisol in patients with dementia. Neurobiol Aging. 1991;12(2):161-3. 71. O'Brien JT, Ames D, Schweitzer I, Colman P, Desmond P, Tress B. Clinical and magnetic resonance imaging correlates of hypothalamic-pituitary-adrenal axis function in depression and Alzheimer's disease. Br J Psychiatry. 1996;168(6):679-87. 72. Hartmann A, Veldhuis JD, Deuschle M, Standhardt H, Heuser I. Twenty-four-hour cortisol release profiles in patients with Alzheimer's and Parkinson's disease compared to normal controls:ultradian secretory pulsatility and diurnal variation. Neurobiol Aging. 1997;18(3):285-9. 73. Swanwick GR, Kirby M, Bruce I, Buggy F, Coen RF, Coakley D, et al. BA. Hypothalamic-pituitary-adrenal axis dysfunction in Alzheimer's disease:lack of association between longitudinal and cross-sectional findings. Am J Psychiatry. 1988;155(2):286-9. 74. Umegaki H, Ikari H, Nakahata H, Endo H, Suzuki Y, Ogawa O, et al. Plasma cortisol levels in elderly female subjects with Alzheimer's disease:a crosssectional and longitudinal study. Brain Res. 2000;881(2): 241-3. 75. Lind K, Edman A, Nordlund A, Olsson T, Wallin A. Increased saliva cortisol awakening response in patients with mild cognitive impairment. Dement Geriatr Cogn Dis. 2007;24(5):389-95. 76. Popp J, Schaper K, Kolsch H, Cvetanovska G, Rommel F, Klingmüller D, et al. CSF cortisol in Alzheimer´s disease and mild cognitive impairment. Neurobiol Aging. 2007;21(3):1-3. 77. Csernansky JG, Dong H, Fagan AM, Wang L, Chengjie X, Holtzman DM, et al. Plasma Cortisol and Progression of Dementia in Subjects with Alzheimer-Type Dementia. Am J Psychiatry;2006;163(12):2164-9. 78. Souza-Talarico JN, Chaves EC, Lupien SJ, Nitrini R, Caramelli P. Relationship between cortisol levels and memory performance may be modulated by the presence or absence of cognitive impairment:evidence from healthy elderly, mild cognitive impairment and Alzheimer's disease subjects. J Alzheimers Dis. 2010;19(3):839-48. 79. Popp J, Wolfsgruber S, Heuser I, Peters O, Hüll M, Schröder J, et al. Cerebrospinal fluid cortisol and clinical disease progression in MCI and dementia of Alzheimer's type. Neurobiol Aging. 2015;36(2):601-7. 80. Gasparini L, Netzer WJ, Greengard P, Xu H. Does insulin dysfunction play a role in Alzheimer's disease? Trends in Pharmacol Sci. 2002;23(6):288-3. 81. Salkovic-Petrisic M, Hoyer S. Central insulin resistance as a trigger for sporadic Alzheimer-like pathology:an experimental approach. J Neural Transm. 2007;72:217-33. 82. Correia SC, Santos RX, Perry G, Zhu X, Moreira PL, Smith MA. Insulin-resistant brain state:The culprit in sporadic Alzheimer's disease? Aging Res Rev. 2011;10(2):264-73. 83. Correia SC, Santos RX, Carvalho C, Cardoso S, Candeia E, Santos MS, et al. Insulin signaling, glucose metabolism and mitochondria: Majorplayers in Alzheimer's disease and diabetes interrelation. Brain Res. 2012;1441:64-78. 84. Santos TO, Mazucanti CHY, Xavier GF, Torrão AS. Early and late neurodegeneration and memory disruption after intracerebroventricular streptozotocin. Physiol Behav. 2012;107(3):401-13. 85. de la Monte SM, Wands JR. Review of insulin and insulin-like growth factor expression, signaling, and malfunction in the central nervous system: relevance to Alzheimer's disease. J Alzheimers Dis. 2005;7(1): 45-61. 86. Lu FP, Lin KP, Kuo HK. Diabetes and the risk of multi-system aging phenotypes:a systematic review and meta-analysis. PloS one. 2009;4(1): e4144. 87. Notarianni, E. Cortisol. Mediator of association between Alzheimer's disease and diabetes mellitus?. Psychoneuroendocrinology. 2017;81: 129-37. 88. Ledochowski M, Murr C, Jäger M, Fuchs D. Dehydroepiandrosterone, ageing and immune activation. Exp Gerontol. 2001;36(10):1739-47. 89. Bastianetto S, Ramassamy C, Poirier J, Quirion R. Dehydroepiandrosterone (DHEA) protects hippocampal cells from oxidative stress-induced damage. Mol Brain Res. 1999;66(1):35-41. 90. Khalil A, Lehoux JG, Wagner RJ, Lesur O, Cruz S, Dupont É, et al. Dehydroepiandrosterone protects low density lipoproteins against peroxidation by free radicals produced by γ-radiolysis of ethanol-water mixtures. Atherosclerosis. 1998;136(1):99-107. 91. Aldred S, Mecocci P. Decreased dehydroepiandrosterone (DHEA) and dehydroepiandrosterone sulfate (DHEAS) concentrations in plasma of Alzheimer's disease (AD) patients. Arch Gerontol Geriatr. 2010;51(1): e16-e18. 92. Genedani S, Rasio G, Cortelli P, Antonelli F, Guidolin D, Galantucci M, et al. Studies on homocysteine and dehydroepiandrosterone sulphate plasma levels in Alzheimer's disease patients and in Parkinson's disease patients. Neurotox Res. 2004;6(4):327-32. 93. Cho SH, Jung BH, Lee WY, Chung BC. Rapid column‐switching liquid chromatography/mass spectrometric assay for DHEA‐sulfate in the plasma of patients with Alzheimer's disease. Biomed Chromatogr. 2006;20(10):1093-7. 94. Cardounel A, Regelson W, Kalimi M. Dehydroepiandrosterone Protects Hippocampal Neurons Against Neurotoxin-Induced Cell Death: Mechanism of Action 2 (44437). Proc Soc Exp Biol Med. 1999;222(2):145-9. 95. Cojocaru IM, Cojocaru M, Miu GA, Sapira V. Study of interleukin-6 production in Alzheimer's disease. Rom J Intern Med. 2011;49(1):55-8. 96. Eikelenboom P, Veerhuis R, Scheper W, Rozemuller AJM, Van Gool WA, Hoozemans JJ. The significance of neuroinflammation in understanding Alzheimer's disease. J Neural Transm. 2006;113(11):1685. 97. Fogal B, Hewett SJ. Interleukin‐1β: a bridge between inflammation and excitotoxicity? J Neuroch. 2008;106(1):1-23. 98. Akiyama H, Barger S, Barnum S, Bradt B, Bauer J, Cole GM, et al. Inflammation and Alzheimer's disease. Neurobiol Aging. 2000;21(3): 383-421. 99. Lai KSP, Liu CS, Rau A, Lanctôt KL, Köhler CA, Pakosh M, et al. Peripheral inflammatory markers in Alzheimer's disease:a systematic review and meta-analysis of 175 studies. J Neurol Neurosurg Psychiatry. 2017; 88(10):876-82. 100. Grimaldi LME, Zappalà G, Iemolo F, Castellano AE, Ruggieri S, Bruno G, et al. A pilot study on the use of interferon beta-1a in early Alzheimer's disease subjects. J Neuroinfl. 2014;11(1):30. 101. Atzmon G, Gabriely I, Greiner W, Davidson D, Schechter C, Barzilai N. Plasma HDL levels highly correlate with cognitive function in exceptional longevity. J Gerontol Biol Sci Med Sci. 2002;57(11):M712-5. 102. Hottman DA, Chernick D, Cheng S, Wang Z, Li L. HDL and cognition in neurodegenerative disorders. Neurobiol Dis. 2014;72:22-36. 103. Van Exel E, de Craen AJ, Gussekloo J, Houx P, Bootsma‐van der Wiel A, Macfarlane PW, et al. Association between high‐density lipoprotein and cognitive impairment in the oldest old. Annals Neurol. 2002;51(6):716-21. 104. Singh-Manoux A, Gimeno D, Kivimaki M, Brunner E, Marmot MG. Low HDL cholesterol is a risk factor for deficit and decline in memory in midlife. Arterioscler, thromb vasc biol. 2008;28(8):1556-62. 105. van den Kommer TN, Dik MG, Comijs HC, Jonker C, Deeg DJ. The role of lipoproteins and inflammation in cognitive decline:Do they interact?. Neurobiol Aging. 2012;33(1):196-e1. 106. Reiss AB, Siller KA, Rahman MM, Chan ES, Ghiso J, de Leon MJ. Cholesterol in neurologic disorders of the elderly:stroke and Alzheimer's disease. Neurobiol Aging. 2004;25(8):977-89. 107. Libby P, Ridker PM. Novel inflammatory markers of coronary risk. Circulation. 1999;100(11):1148-50. 108. Sacco RL, Benson RT, Kargman DE, Boden-Albala B, Tuck C, Lin IF, et al. High-density lipoprotein cholesterol and ischemic stroke in the elderly: the Northern Manhattan Stroke Study. JAMA, 2001;285(21):2729-35. 109. Cockerill GW, Huehns TY, Weerasinghe A, Stocker C, Lerch PG, Miller NE, et al. Elevation of plasma high-density lipoprotein concentration reduces interleukin-1-induced expression of E-selectin in an in vivo model of acute inflammation. Circulation. 2001;103(1):108-12. 110. Song F, Poljak A, Crawford J, Kochan NA, Wen W, Cameron B, et al. Plasma apolipoprotein levels are associated with cognitive status and decline in a community cohort of older individuals. PloS One. 2012; 7(6):e34078. 111. Merched A, Xia Y, Visvikis S, Serot JM, Siest G. Decreased high-density lipoprotein cholesterol and serum apolipoprotein AI concentrations are highly correlated with the severity of Alzheimer's disease☆. Neurobiol Aging. 2000;21(1):27-30. 112. Reitz C, Tang MX, Schupf N, Manly JJ, Mayeux R, Luchsinger JA. Association of higher levels of high-density lipoprotein cholesterol in elderly individuals and lower risk of late-onset Alzheimer disease. Arch Neurol. 2010;67(12):1491-7. 113. Bonarek M, Barberger-Gateau P, Letenneur L, Deschamps V, Iron A, Dubroca B, et al. Relationships between cholesterol, apolipoprotein E polymorphism and dementia:a cross-sectional analysis from the PAQUID study. Neuroepidemiology. 2000;19(3):141-8. 114. Barnes DE, Yaffe K. The projected effect of risk factor reduction on Alzheimer's disease prevalence. Lancet Neurol. 2011;10(9):819-28. 115. Profenno LA, Porsteinsson AP, Faraone SV. Meta-analysis of Alzheimer's disease risk with obesity, diabetes, and related disorders. Biol Psychiatry. 2010;67(6):505-12. 116. Beydoun MA, Beydoun HA, Wang Y. Obesity and central obesity as risk factors for incident dementia and its subtypes:a systematic review and meta‐analysis. Obes Rev. 2008;9(3):204-18. 117. Koyama A, O'Brien J, Weuve J, Blacker D, Metti AL, Yaffe K. The role of peripheral inflammatory markers in dementia and Alzheimer's disease:a meta-analysis. J Gerontol Biom Sci Med Sci. 2012;68(4):433-40. 119. Karlamangla AS, Miller-Martinez D, Lachman ME, Tun PA, Koretz BK, Seeman TE. Biological correlates of adult cognition:Midlife in the United States (MIDUS). Neurobiol Aging. 2014;35(2):387-94. 120. Booth T, Royle NA, Corley J, Gow AJ, Hernández MDCV, Maniega SM, et al. Association of allostatic load with brain structure and cognitive ability in later life. Neurobiol Aging. 2015;36(3):1390-9. 121. Goldman N, Turra CM, Glei DA, Seplaki CL, Lin YH, Weinstein M. Predicting mortality from clinical and nonclinical biomarkers. J Gerontol Biol Sci Med Sci. 2006;61(10):1070-4. 122. Karlamangla AS, Singer BH, Seeman TE. Reduction in allostatic load in older adults is associated with lower all-cause mortality risk:MacArthur studies of successful aging. Psychosom Med. 2006;68(3):500-7. 123. Davis SR, Shah S, McKenzie D, Kulkarni J, Davison S, Bell R. Dehydroepiandrosterone Sulfate Levels Are Associated with More Favorable Cognitive Function in Women. Clin Endocrinol Metabol 2008;93(3):801-8. 124. Takeda JRT, Matos TM, Souza-Talarico JN. Cardiovascular risk factors and cognitive performance in aging. Dement Neuropsychol, 2017;11: 442-48. 125. Hassing LB, Dahl AK, Pedersen NL, Johansson B. Overweight in midlife is related to lower cognitive function 30 years later:A prospective study with longitudinal assessments. Dement Geriatr Cogn Disord. 2010;29:543-52. 126. Harvey J, Solovyova N, Irving A. Leptin and its role in hippocampal synaptic plasticity. Prog Lipid Res. 2006;45:369-78. 127. Perez-Gonzalez R, Antequera D, Vargas T, Spuch C, Bolos M, Carro E. Leptin induces proliferation of neuronal progenitors and neuroprotection in a mouse model of alzheimer's disease. J Alzheimers Dis. 2011;24(Suppl 2):17-25. 128. Niedowicz DN, Studzinski CM, Weidner AM, Platt TL, Kingry KN, Beckett TL, Bruce-Keller AJ, Keller JN, Murphy MP. Leptin Regulates Amyloidβ Production Via the γ-Secretase Complex. Biochim Biophys Acta. 2013;1832(3):439-44. 129. Lieb W, Beiser AS, Vasan RS, Tan ZS, Au R, Harris TB, et al. Association of plasma leptin levels with incident alzheimer disease and mri measures of brain aging. JAMA. 2009;302:2565-72. 130. Power DA, Noel J, Collins R, O'Neill D. Circulating leptin levels and weight loss in alzheimer's disease patients. Dement Geriatr Cogn Disord. 2001;12:167-70. 131. Holden KF, Lindquist K, Tylavsky FA, Rosano C, Harris TB, Yaffe K. Serum leptin level and cognition in the elderly:Findings from the health abc study. Neurobiol Aging. 2009;30:1483-9. 132. Benson S, Arck PC, Tan S, Mann K, Hahn S, Janssen OE, et al. Effects of obesity on neuroendocrine, cardiovascular, and immune cell responses to acute psychosoial stress in premenopausal women. Psychoneuroendocrinology. 2009;34:181-9. 133. Watanabe Y, Kitamura K, Nakamura K, Sanpei K, Wakasugi M, Yokoseki A, et al. Elevated C-Reactive Protein Is Associated with Cognitive Decline in Outpatients of a General Hospital:The Project in Sado for Total Health (PROST). Dement Geriatr Cogn Dis Extra. 2016;6(1):10-9. 134. Noble JM, Manly JJ, Schupf N, Tang MX, Mayeux R, Luchsinger JA. Association of C-Reactive Protein With Cognitive Impairment. Arch Neurol. 2010;67(1):87-92. 135. Otaegui-Arrazola A, Amiano P, Elbusto A, Urdaneta E, Martinez-Lage P. Diet, cognition, and Alzheimer's disease:food for thought. Eur J Nutr. 2014;53:1-23. 136. Santos JR, Gois AM, Mendonça DM, Freire MAM. Nutritional status, oxidative stress and dementia:the role of selenium in Alzheimer's disease. Front Aging Neurosci. 2014;6:206. 137. Spaccavento S, DelPrete M, Craca A, Fiore P. Influence of nutritional status on cognitive, functional and neuropsychiatric deficits in Alzheimer's disease. Arch Gerontol Geriatr 2009;48:356-60. This study was conducted at the School of Nursing, Department of Medical-Surgical Nursing, University of São Paulo, São Paulo, SP, Brazil.